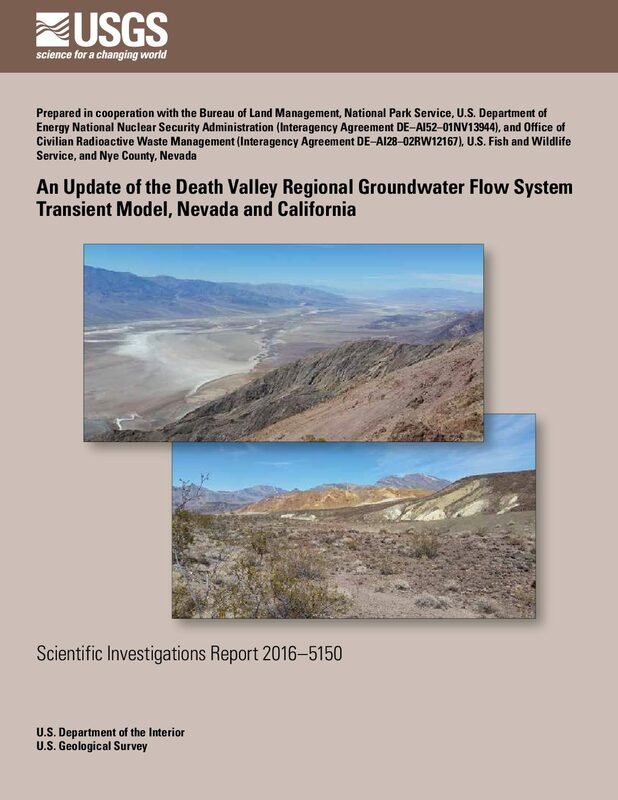 The U.S. Geological Survey (USGS) has revised the regional-scale Death Valley regional groundwater flow system (DVRFS) numerical model with new data and interpretations since the original numerical flow model was published in 2004 (Belcher (2004); re-published as Belcher and Sweetkind ). 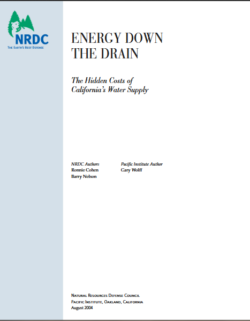 Since the original publication of the DVRFS flow model, additional data have been collected and interpretations have been made. Cooperators such as the Bureau of Land Management, National Park Service, U.S. Fish and Wildlife Service, the Department of Energy, and Nye County, Nevada, recognized a need to update the existing regional numerical flow model to maintain its viability as a groundwater management tool for regional stakeholders. For the purposes of this report, the version of the DVRFS numerical flow model documented in Belcher and Sweetkind (2010) and Faunt, Blainey, and others (2010) is designated as DVRFS v. 1.0. The updated version, as presented in this report, is referred to as DVRFS v. 2.0. Knowledge of basin water balances and the magnitude of interbasin groundwater flow is the basis for regional groundwater management and water-resource planning in the Great Basin of Nevada (Scott and others, 1971). Rapid population growth, arid conditions, and increased water use have led to development of available groundwater resources. Groundwater use in some alluvial-fill basins has resulted in continued water-level declines and land subsidence. 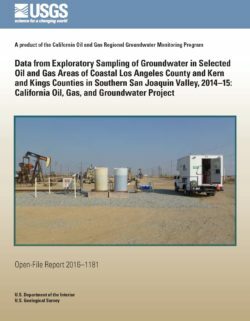 Adjacent bedrock aquifers are increasingly being targeted for additional development. Such groundwater development may potentially impact local and regional water quantity and quality, existing water rights, and wildlife habitats. An understanding of hydrogeologic processes that control the rate and direction of groundwater flow in southern Nevada is necessary to assess the potential effects of any proposed large-scale groundwater development. Potential water-resource conflicts exist because of disparate interests in the region, particularly with respect to the development of groundwater resources to meet agricultural, municipal, and industrial water demand and the need to protect habitat for endangered and threatened species. Water demands in the Amargosa Farms area from agricultural and suburban development, and rapidly urbanizing areas in Las Vegas and Pahrump Valleys place increasing pressure on existing groundwater resources. In addition, several solar-energy facilities have been proposed within the Death Valley region; water demands for these facilities will vary. Natural groundwater discharge at springs and seeps sustains habitat for numerous species, many of which are threatened, endangered, or otherwise considered sensitive. In 2004, the USGS documented a calibrated numerical flow model of the DVRFS (Belcher, 2004). The model, DVRFS v. 1.0, incorporated elements of several precursor numerical models but defined the boundaries of the regional flow system slightly different than in previous versions. The model simulates transient groundwater flow conditions in the DVRFS from 1913 through 1998. The report was subsequently revised and published as a USGS Professional Paper (Belcher and Sweetkind, 2010). 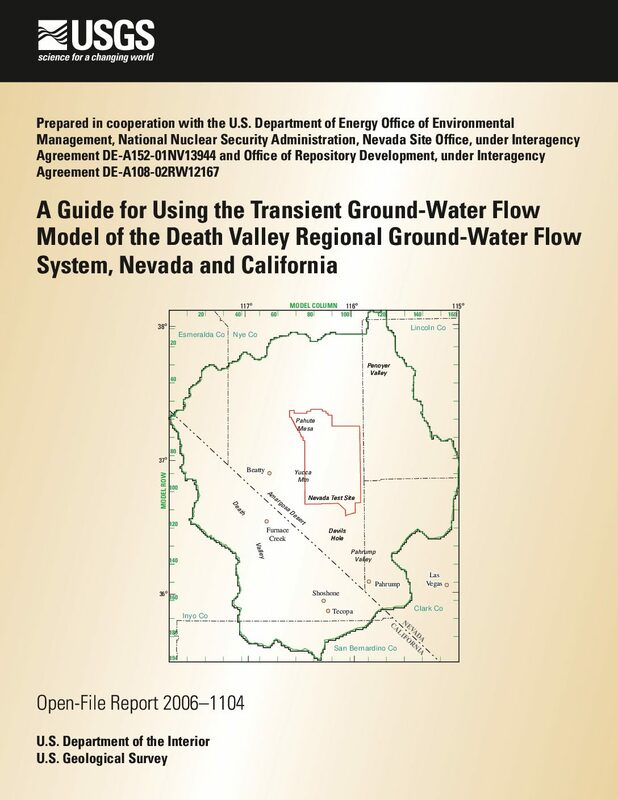 Since release of DVRFS v. 1.0 in 2004, continued use of the model by cooperators, stakeholders, and interested parties in the region has demonstrated the need to improve specific aspects (such as the flow into northern Yucca Flat and parts of the Amargosa Desert), to update it with more recently acquired geologic and hydrologic data, and to extend the simulation period. 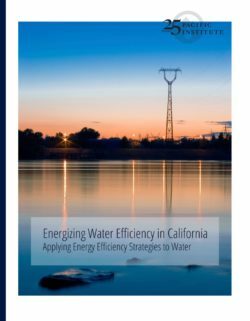 The California Department of Water Resources (DWR) in an effort to reduce its impact on the environment and lead by example, has developed this Greenhouse Gas (GHG) Emissions Reduction Plan to guide its project development and decision making with respect to energy use and GHG emissions. It is now clearly understood that these gases enhance the Earth’s ability to absorb and retain the heat radiated from the sun. Increased concentrations of GHGs in the atmosphere are the principal cause of anthropogenic climate change. 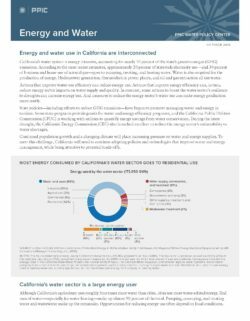 As the connection between GHG emissions and climate change has strengthened and California has established GHG policies and reduction goals, DWR has focused on its own GHG emissions and developed strategies to reduce its contribution to the global problem of climate change consistent with those policies and goals. This GHG Emissions Reduction Plan (Plan) is the first Phase in DWR’s Climate Action Plan and considers GHG emissions from all DWR activities. 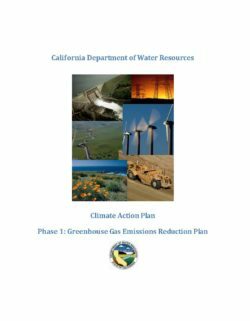 In this Plan, DWR details its progress and future plans for reducing GHG emissions consistent with the GHG emissions reduction targets established in Assembly Bill (AB) 32, Executive Order S-3-05, and DWR’s own policies, the aggressive steps it will take to reduce its emissions by over 80% below 1990 levels, and the steps that it will take to monitor its progress toward achieving these reductions. DWR estimates that its total GHG emissions in 1990 were nearly 3.5 million metric tons, roughly the equivalent of a coal fired power plant or 680,000 passenger cars. Most of these emissions were released as a result of generation of electricity used to move water through the State Water Project (SWP), which DWR owns and operates. 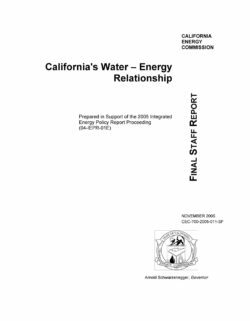 Since 1990, DWR’s GHG emissions have fluctuated due to hydrologic conditions, water demands, and energy resources. DWR GHG emissions peaked in 2003 at over 4.1 million metric tons per year. This Plan shows how DWR will make substantial reductions in its GHG emissions in the near-term (present to 2020) and how it will continue to reduce emissions beyond 2020 to achieve its long-term (2050) GHG emissions reduction goals. 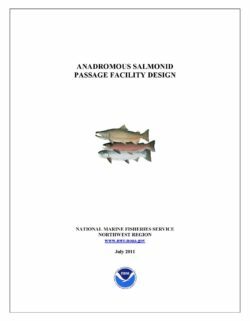 This document provides guidelines for design of stream crossings to aid upstream and downstream passage of migrating salmonids. It is intended to facilitate the design of a new generation of stream crossings, and assist the recovery of threatened and endangered salmon species. These guidelines are offered by the National Marine Fisheries Service, Southwest Region (NMFS-SWR), as a result of its responsibility to prescribe fishways under the Endangered Species Act, the Magnuson-Stevens Act, the Federal Power Act, and the Fish and Wildlife Coordination Act. 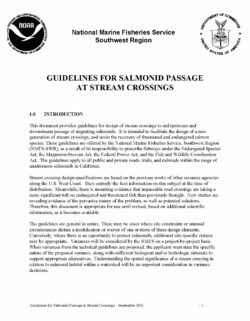 The guidelines apply to all public and private roads, trails, and railroads within the range of anadromous salmonids in California.